The Chamber is delighted to announce that its current President, Amanda Glover, Managing Director of BakerLaw LLP, a Farnham based law firm has won the Visionary Leadership Award 2018 at the Chartered Institute of Legal Executives (CILEx) National Awards. The Awards celebrate the best and brightest in the legal profession. The ceremony was held on 6 September 2018 at Shakespeare’s Globe in London. Amanda was one of two finalists for the Visionary Leadership Award 2018. Amanda’s commercialism stems from a background that covers business and finance as well as law. It is that very business acumen that has helped Amanda lead and shape BakerLaw LLP into a progressive and growing law firm. Part of her strategic vision is to ensure service excellence throughout. In a drive to assure their legal standing, Amanda took the firm to gain Lexcel Accreditation without a single non-conformity. 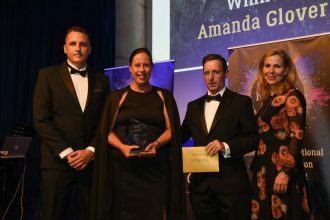 The Farnham Chamber of Commerce would like to congratulate Amanda on winning such a prestigious award. Well done Amanda!